For decades, the United States has arguably been one of the most influential music markets in the entire world. While a handful of other countries are beginning to gain significant influence within the industry, there is no denying that the U.S. market is the biggest. The music industry generated around 51.5 billion U.S. dollars globally in 2018, with around 19.6 billion of that coming from the U.S. alone. Over the past few years, streaming has become a massive force in the music industry, especially among young consumers. 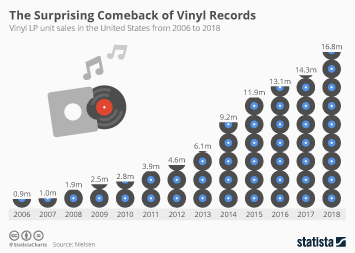 Similarly to how digital music downloads replaced physical album sales around a decade ago, streaming has quickly replaced digital music downloads as the most common method of music consumption in the U.S. Forecasts predict streaming revenues to continue to grow in the coming years, with digital music revenue from streaming in the U.S. expected to reach nearly 8 billion U.S. dollars by 2022. Along with streaming services, online radio is also gaining popularity, with Americans spending an average of 820 minutes per week listening to online radio as of 2018. Companies such as iHeartRadio and Pandora have been particularly popular in this market. Live music is also a growing part of the United States music industry. Around one third of U.S. consumers reported to have attended at least one live music concert in 2017. Artists such as U2, Bruno Mars, Metallica, and Garth Brooks all had tours that generated over 100 million U.S. dollars in revenues in 2017, with U2’s tour selling over 1.5 million tickets. Overall, the music industry seems to be healthy and growing. Nearly 70 percent of Americans state that they listen to music every day, with even higher percentages among the younger generations and increases in technology have also allowed music to be shared and discovered more easily through platforms such as YouTube and Facebook. As of 2017 U.S. consumers spend an average of 32 hours per week listening to music, compared to just 23.5 hours in 2015, showing that the worlds largest music market is only getting larger. Music industry revenue in the U.S.